Thyroid conditions are nothing new. Iodine deficiency goiters have plagued humans for centuries. However, there seems to be a recent escalation in the incidence rate of thyroid conditions, which may largely be affected by factors such as birth control pills, industrial pollutants, and food-based hormones such as BGT. If you are a woman over 35 years of age and struggle with feeling cold all the time, slightly depressed or anxious, hair loss, brittle nails, muscle cramps, carpal tunnel syndrome, constipation or chronic swelling in your throat… you may have a thyroid imbalance. Thyroid disease affects 2.5% of the American population, or roughly 7,700,000 people. More Americans are affected by the precursors to Thyroid disease, hyperthyroidism and hypothyroidism. Women are four times more likely to suffer hyperthyroid disorder than men, eight times more likely to suffer hypothyroid disorder, and twice as likely to suffer thyroid tumors. Let’s take a look at what exactly the Thyroid gland does, and explore natural treatment options. Thyroid disorders are a type of immune system disorder, and we have been discussing immunity for several weeks now through our BLOG. Where is the thyroid gland, and what does it do? The thyroid gland is part of the endocrine system. It is located in the neck and is butterfly shaped, with two distinct lobes. Thyroid gland disorders affect mainly women over the age of 35. A person may suffer from hypothyroidism or hyperthyroidism. Some of the activities in the body that thyroid hormones affect are: calcium absorption in the blood, bone density, weight gain/weight loss, body temperature. The thyroid gland produces hormones that regulate key functions in our body, primarily protein synthesis and oxygen utilization. Thyroid activity is controlled by a hormone released from the pituitary gland in the brain called TSH (Thyroid Stimulating Hormone). TSH determines how much hormone quantity the thyroid secretes. These secretions have a great impact on the basal metabolic rate (BMR). TSH levels are also impacted by the hypothalamus (another gland in the brain), and by other regulatory mechanisms that work in conjunction to produce a feedback loop so that as TSH increases, other thyroid hormones decrease. The reverse is also true. Western science often measures two thyroid hormones found in the blood plasma, marked T3 and T4, as key indicators of thyroid function. Hyperthyroidism is caused by excess secretion of thyroid hormones and affects the sympathetic nervous system by causing a “speeding up” of various body symptoms. This can cause a person to live in fight or flight mode, and often results in anxiety, heart palpitations, tremors, and digestive hypermotility (diarrhea). Hypothyroidism is exactly the opposite. Too little thyroid hormone is secreted and this can affect the sympathetic nervous system by causing hypothyroidism. Can TCM treat thyroid conditions? It is only in the past 50 years that TCM practitioners have begun to use Western testing methods to determine a clear diagnosis as to the location and type of thyroid disorder a patient has. This shift in thinking correlates to the increase in the rate of incidence of thyroid related disorders. Early precursors to hyperthyroidism include a syndrome in TCM called yin-deficiency fire. Symptoms of yin deficiency fire include: increased thirst, red skin, brittle hair, red pointy tongue with no coat, irritability, insomnia. Treatments for yin-deficiency fire can be used to treat hyperthyroidism, and can lead to a reduction in TH secretion. Clinically, hyperthyroid treatments have been highly successful in clinical trials in China and in clinics across the United States. Hypothyroidism results from the inactivity of the thyroid gland. Hypothyroidism is often treated by stimulating the adrenal and kidneys using acupuncture and herbal medicine. While the tendency towards low thyroid secretion may never completely go away, the symptoms of cold body temperature, water retention, and depression are well managed through TCM methods of care. If you have received a firm diagnosis from an endocrinologist that you have abnormal thyroid activity, or you experience any of the symptoms we have discussed previously, it is a very good idea to contact an Oriental Medical Doctor to discuss treatment options before going on hormone replacement therapies, or having a thyroidectomy. 1. Disturbance of qi by sorrow and anger: Liver and spleen qi become disharmonious. As a result, phlegm accumulates in the neck and forms a goiter. Swelling in the neck is one of the first symptoms to result when phlegm accumulation is a primary cause. 2. Heart Fire: This disorder is typically brought about by other factors in a person’s life such as stress and diet, and the condition is typified by highly agitated emotional conditions: anxiety, mania, panic, extreme fright, excessive talking, insomnia, and heart palpitations. Heart Fire is often is associated with a heart yin deficiency and is effectively treated through herbs that restore heart yin. 3. Live Fire: Extreme anger, or a high-sugar/high-alcohol/greasy diet may cause liver fire. Liver fire dries yin and blood. The vessels surrounding the thyroid begin to bulge and aggravate the gland, causing a snowball effect. While TCM has only recognized “thyroid disorders” as related to hormone problems in the past 50 years, it has a 4,000 year history of treating liver fire effectively! 4. External Factors: Geography is a big determinant in this case. 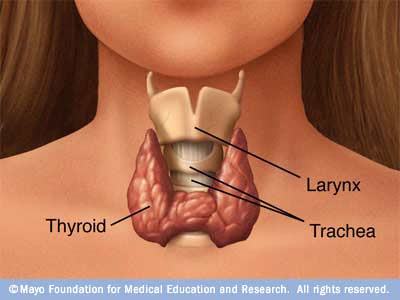 Iodine deficiency, genetically modified foods, or environmental toxins can induce thyroid disease. Basically, TCM can treat qi disturbance, heart fire, liver fire, and help with detoxification treatments to rid the body of environmental contaminants. When these conditions are treated effectively, then the thyroid is not disturbed and problems such a as hypothyroidism or hyperthyroidism are either managed effectively, or are resolved entirely. Is there “proof” this works? In my own clinical experience over the past 12 years I have treated many cases of thyroid disorder successfully. There are case studies in the United States, UK and Scandanavia that detail the effectiveness of these treatments. If the Horse’s Mouth isn’t good enough for you, China has conducted numerous clinical studies in hospitals proving the effectiveness of TCM herbal treatments, and the references to 51 clinical trials may be found by clicking here!